This item is no longer available, please consider the 4G RAM Version as a replacement. 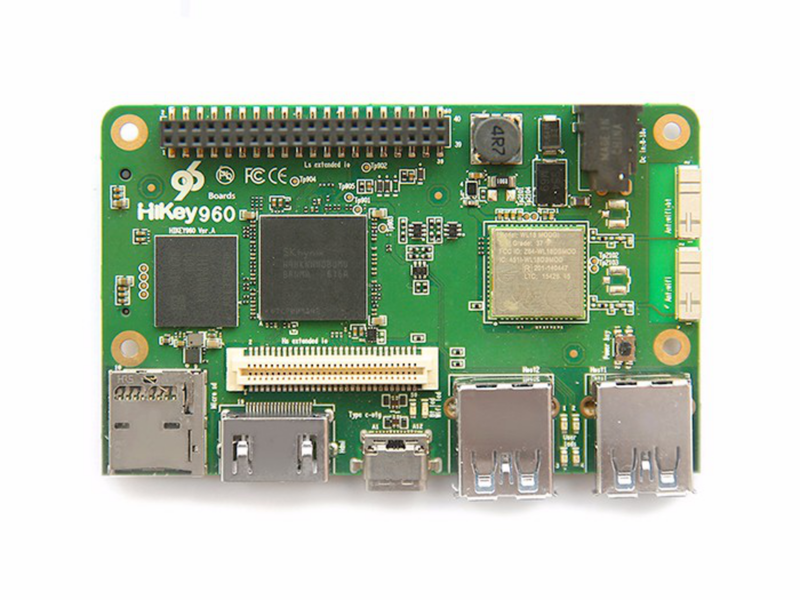 The HiKey 960 is powered by the latest Kirin 960 SoC with four ARM Cortex-A73 CPUs (up to 2.3GHz) and four ARM Cortex-A53 CPUs (up to 1.8GHz) configured according to the big.LITTLE architecture. The integrated Mali™-G71 MP8 GPU in the Kirin 960 SoC gives the HiKey 960 high performance image processing abilities. With 3GB LPDDR4 memory and 32GB UFS flash on board, the HiKey 960 can be used for most embedded applications. The HiKey 960 has updated the USB Type-A host from USB2.0 to USB3.0 compared to the original HiKey board. In order to enhance the expansion ability, the HiKey 960 includes a PCIE Gen2 on M.2 M Key connector to enable PCIE device connection. The HiKey 960 also includes an updated WiFi module supporting 2.4GHZ single band to 2.4- and 5.0GHz dual band with two antennas. Android support for the HiKey 960 will be enabled through Android Open Source Project (AOSP). Additional software support will be added through collaboration between Huawei, Linaro and the community.